Keep warm and look stylish this spring with Batty sweaters from Sourpuss! 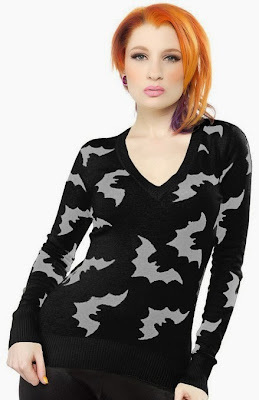 Sourpuss' Batty sweater is in black with gray bats. It's also sold on Amazon. Sourpuss also makes a batty sweater dress in this color combination. The Sourpuss Batty cardigan is in black and white. It's also sold on Amazon. Here's the batty sweater in a fresh spring green with black bats. It's also available through eBay.